View our complete image gallery and shopping guide. View our complete image gallery and guide. Click here for a comprehensive gallery. Featuring graded/un-graded original cards, packs and complete sets. 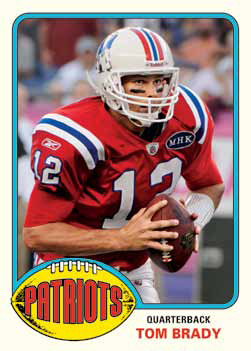 2013 Topps Archives Football brings the popular nostalgia-driven baseball brand to the gridiron. Mixing several classic designs, the set also blends current players with retired favorites. The 2013 Topps Archives Football base set is inspired by four Topps Football designs from the past: 1959, 1976, 1985 and 1986. The 200-card checklist has both today's stars and several of the game's legends. There are also 40 high number short prints and several extremely tough short print variations. Gold parallels fall two per hobby box. One-of-one Printing Plates are hobby-exclusives. Every hobby box promises two autographs. Leading them are Fan Favorites Autographs, which bring signatures from some of the past's most popular players. They may not be the game's biggest names, but they all have strong followings. Many aren't regular signers either. 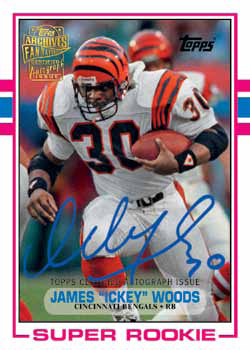 Among those with Fan Favorites Autographs are "Ickey" Woods, Christian Okoye, "Flipper" Anderson, Ben Coates, Mercury Morris and Eric Allen. Fan Favorites autographs use designs from the featured player's era. 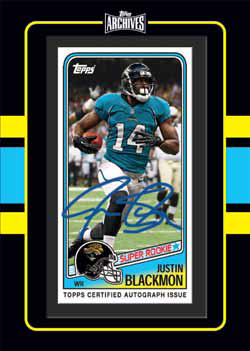 The 2013 Topps Archives Football Fan Favorites Autographs checklist has more than 50 players. 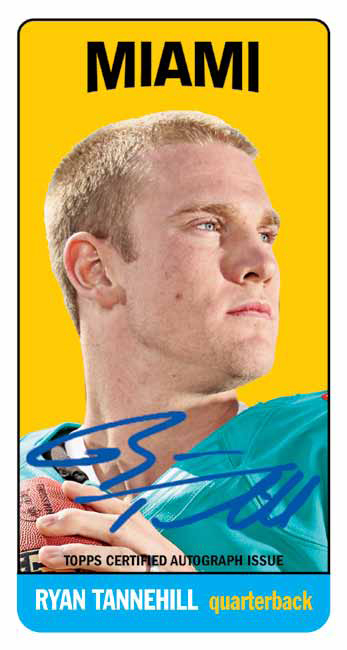 Fan Favorites aren't the only autographs in 2013 Topps Archives Football, though. Framed Mini Autographs are inspired the 1988 Topps Football design. Each of the 25 cards are numbered to 25. Topps Originals Autographs features buyback autographs numbered to 10. An additional ten buybacks are included in Autographed USFL Buybacks. These are on cards from the rival league. 1984 Topps Autograph Book Cards pair autographs from top 2012 rookies. Each is a one-of-one. Finally, the set has random 1980s Celebrity Cut Signatures. Topps reaches back in time for several basic insert sets as well. These include 1968 Topps Standups (15 cards), 1970 Topps Glossy (25 cards, 1:6 packs) and 1,000-Yard Club Rack Pack Inserts (25 cards, 1:8 packs). Topps Originals are original Topps cards from the past that come with a special "Topps Originals" foil stamp. 2013 Topps Archives Football also has several prize redemptions. Collectors can get original cards, packs and sets, uncut base set sheets and items from the Topps vault. 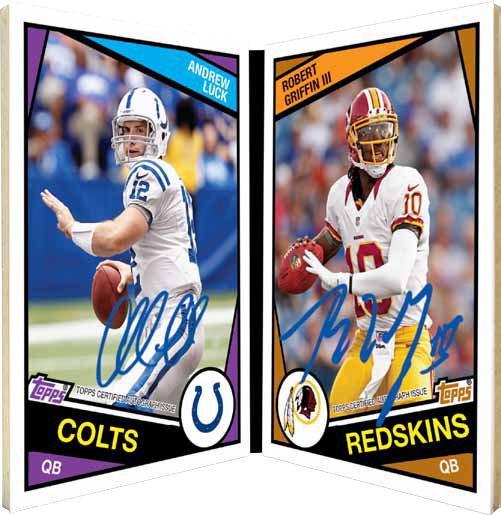 Box loaders return in 2013 Topps Archives Football. 1965 Topps Tall Boy Autographs use the popular design. Unlike the shrunken cards inserted in 2012 Topps Football, these maintain the original 1965 Topps design. Each is numbered to 25. Jumbo Touched by Greatness cards (#/10) include both a hand print and an autograph from a fan favorite player. Box bottoms, a staple in many 1980s Topps products, return. Each hobby box has cards printed directly on the underside of the box. These use the 1985 Topps design. Good: Nostalgic feel. Current players on retro designs. Two guaranteed autographs per box. Reasonably priced. Bad: Short print variations are hard to find. Set collectors will have a challenge. Card stock is very thin. No 2013 rookies. Cards for 2012 rookie players list collegiate statistics instead of rookie statistics. The Bottom Line: At this price level, there isn't a lot of risk with Topps Archives. It really boils down to what your feelings are on this type of product. If you're only looking for high-end rookie autographs or big hits, this probably isn't for you. Collectors who enjoy set collecting or products that are a little different should enjoy this. Topps Archives features base designs from the 1959, 1976, 1985 ,and 1986 Topps Football sets. I personally like all of the designs, except for the 1985 design. While I enjoy the borders and cards overall, I prefer the vertical images as opposed to the horizontal layouts. Seeing newer players on older designs gives you a sense of cardboard history. I always wanted to open the older boxes too, so this sort of takes care of that, vicariously. Just like in the 1980's, Topps has printed cards directly on the bottom of the boxes. It's a nice touch. Topps has included many interesting insert sets in this throwback product. 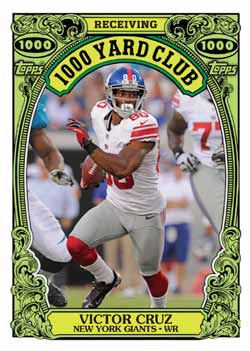 My favorites are the 1000-Yard Club cards. Reaching 1000 yards is more common that it was years ago, but it is still a fun and attractive insert set. The Fan Favorite Autographs are the base autograph set in this product. Autographs are signed on-card, which is a plus. Tall Boy Autographs will be a huge hit for collectors who remember those oversized cards from their early childhood. The Framed Mini Autograph design is similar to the 1988 Topps Football set. They are sharp looking and appear larger than they actually are. Each base design consists of 50 players for a total of a 200-card base set. The base checklist is comprised of 2012 rookies, veterans and retired players. An additional 40 retired players are featured in the high number short print checklist. This makes for a sizable and challenging set to build. Fan Favorite Autographs feature names that are not the biggest, but they will be popular among collectors because they are, indeed, fan favorites. Somewhat out of place, 1980s Celebrity Cut Signatures can also be found. I'm not a fan of these, but they definitely have a following. Overall, I like the rather large list of players, but it would be better if the 2013 rookie players were included in a 2013 product. Most of the more valuable hits are hard to find in this product. Collectors will need to get lucky or scour the secondary market for them. The true value of this set is the overall feeling of nostalgia and excitement experienced when current players meet classic retro designs. Topps Archives offers a variety of autograph sets to chase, as well as a fairly deep checklist of players. This product allows collectors to reminisce about the history of football card collecting and helps connect it to today's hobby. This product is more about ripping packs and getting a nostalgic feel than hitting on big autographs. It reminds collectors why we fell in love with the hobby in the first place. Pulling autographs of players without many certified autographs adds to the overall excitement of the product. Are you sure it’s 4/19/12? I think you made an error on the release date. Tom (ID 75788) � Thanks. I love time machines but not really sure everyone has one. Love the Archives Baseball product this year and hope the FB creates the same buzz and excitement. I’m a fan. Brings back memories. Im a little curious. Since this is a 2013 product. Will Adrew Luck, RG3, etc… still be considered rookies in this set? Billy � I’m sure some people will claim they’re rookies, but as a 2013 set they should be considered second-year cards. I am just starting to get pack in to collecting after a decade hiatus. How do you think that will affect the Value of the cards? Billy � For the base cards, they won’t carry as much prestige as the rookies but Luck and RG3 are also superstars so there will be demand. Great to see an archives football product, but- buyer beware! Card stock is PAPER THIN- similar to Donruss 1982 baseball! I just came back from a minor grocery run to Walmart. My daughter moves out today with a roommate right across the street from Kent State University. It’s a convenient situation. Of course the grocery run was for her. What does this have to do with 2013 Topps Archives? As I mentioned, convenience is going to get groceries and finding a new release available in one location. With this in mind, this is a great and inexpensive way to test a new release. I know that this set is a throwback to simpler days which is fantastic. This allows novices like myself and young collectors to be exposed and made aware of vintage cards. Topps accomplishes this trait. The cards are printed on old school type stock. It’s one thing to purchase vintage cards like this, it’s another to do this on a new release. I’m not a fan of this! Just take a look at 2012 Topps Chrome. Throwback designs on great card stock. Other than this fact, I think Topps has done an excellent job. Now I’ll have to see if I can purchase some ’50’s and 60’s cards on eBay! I picked up a blaster tonight, this set is very strange, no 2013 draft picks, and the 2012 rookies have college stats on the back of the cards, which make them look like rookies. WOW… I picked up a blaster earlier today and I have never seen anything like this,I have never had so much fun opening a blaster box. I started collecting football cards in the early 90’s so for anyone who also has, be ready to get nostalgic. I am more than psyched to pick up a hobby box. Unfortunately, i’ll have to wait till next Tuesday.Obviously this isn’t a product for the hit seekers (But i did pull an auto!,some browns QB from the early 80’s). Yet there is nothing to dislike about this set if your a long -time Topps fan. The variety and attention to detail on these cards is so amazing,each individual card draws you in, stands out and gives you a little history lesson.There is so much variety I don’t even know what the inserts are supposed to be? but this is def the most interesting and most fun Football card sets to come out in a super loooong time and it’s reasonably priced and will hold the interest for pretty much any type of collector,young or old. I love topps archives 2013!, they simply outdid themselves here. Off to print the check list! Jeff Schwind � Please note the checklist isn’t quite final. We’re expecting it later today. Is there any ETA of when the final checklist will be out? We were hoping yesterday but with the Rookie Premiere getting underway, there are lots of people who are very busy this week. I picked up a hobby box and enjoyed the product. I have been seing some pretty crazy stuff in the form of redemptions show up any EBAY any more details on when the checklists and print runs are going to be out? Garrett � We’ve requested a final checklist a couple of times now and have been simply told “soon.” As for print runs, if they’re not numbered, it’s unlikely Topps will release them. The 2 autographs i got were of two NO-NAME players from the ’80s! Why pay $70 per box for them when you could go down any street and get autographs from any old schmoe for free. I received a Marcus Lattimore Redemption Auto card in a box I purchased late last week. I want to sell it and its listed on my store. I just have not idea on value. I have seen that Matt Barkley and Montee Ball have similar redemptions on eBay. List it at a high-ish Buy It Now and accept offers is probably your best bet. I like the elusive variations, picked up a couple of hobby packs from local card shops & retail blasters from Target & Walmart also have 2 hobby boxes on the way. I have always been a sucker for topps archives sets, classic throwback designs always pique my interest. To me this is the more affordable fix to 2012 Fleer Retro. I just got a 81SA-AL yellow printing plate 1 of 1. Is this worthless? WELL I WASNT TOO TOO MUCH OF A FAN OF IT AFTER BUYING SEVERAL BLASTERS BUT AFTER BUSTING A HOBBY BOX,WOW!,IM SOLD..,PULLED A D.MARTIN 1/1 MAGENTA P-PLATE,TRENT RICH GOLD PHOTO VARIATION SSP(UNPRICED,1/5 CASES),LUCK &BLACKMON STAND-UPS,RG3,LUCK,FAN FAV AUTOS OF L.BUTLER &ICKEY +THE BOX BOTTOM WAS EVEN LUCK,TANNEHILL,BRADY &MANNING SO I WAS VERY LUCKY TO SAY THE LEAST! RG3,LUCK,WILSON,MARTIN,BASE I WAS MEANING TO SAY AFTER LUCK &BLACKMON STAND-UPS! I absolutely love the product. I’m a huge fan of the 1980s as far as football cards and with the possible exception of the 1984 design, the 1985 design is the best and the 1986 design is right there. Those were the only three years where Topps went “wild” with its design between 1979-1990. The short prints and various inserts have been a joy to put together. Please tell me why. There are no 1962 Russell Wilson. Relic cards out there IS. It a rare card? Please someone give me a straight answer. Topps doesn’t normally give out print runs for unnumbered cards. They’re the best ones to contact for how rare it is.